The Mossmouth Forums > Games > Spelunky Classic > Spelunky Love! Hey, guys! 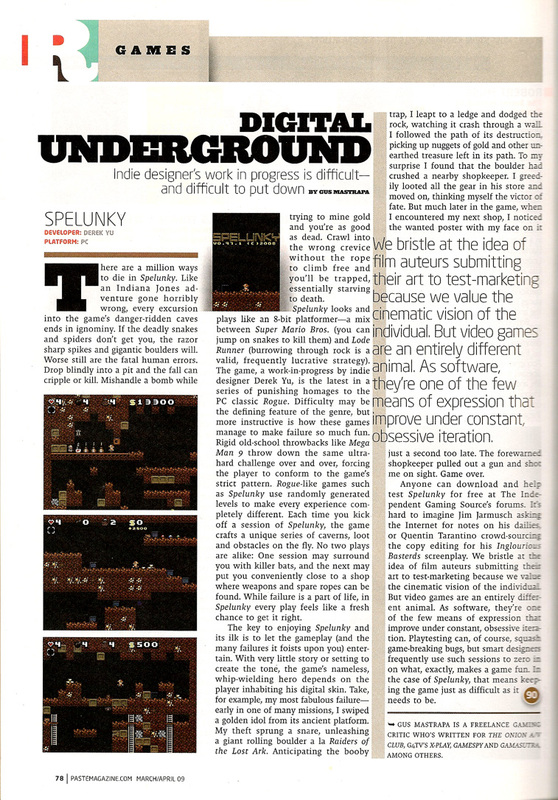 I'm starting a thread to keep track of all the cool mentions Spelunky is getting on the webz and in print. Please post in the thread if you see something interesting. Yay. The Escapist - "Derek Yu's Spelunky may well be one of the most unassumingly mindblowing games of the last 10 years." Paste Magazine - "While failure is a part of life, in Spelunky every play feels like a fresh chance to get it right." Oh, wow. I never thought non-commercial games could get such buzz. But that's cause I haven't been around so much. Anyways, Derek, congrats on the buzz. I once saw Spelunky in the games corner in a magazine I read called "Boy's Life." Indie games are just as awesome and hyped as commercial games. Though you may have to get into the indie scene first. It's great to see indie games getting so much love these days. Oh man, does anyone have a scan of that? I loved Boy's Life when I was a scout. I was never a scout. Shame on me. But my local Boy Scout troop sucked, according to Mom. So I never joined. But I still subscribed to Boy's Life. It was great. When did you see Spelunky, audioworm? Dark Jester of Red Moon! I thought I would post this,as founder of this site,who also made review of this,passed away on February 3rd 2010..
What the heck do you do in Boy Scouts? You learn to do a good turn daily, as well as learn how to be a good citizen, smart outdoors-man, and all around good at most things. You learn to be prepared, you are trustworthy, loyal, helpful, friendly, courteous, kind, obedient, cheerful, thrifty, brave, clean, and reverent. You promise in your oath to be mentally smart, physically strong, and morally straight. I'd suggest you read up on it. Sound's like far-rightist propaganda to keep you under control and influence you in your future decisions if you ask me. Was nobody here a child? I don't know anyone that ever went to boy scouts, I don't live with a 100 miles of one anyway. I never went to boy scouts. I was one of dem swimmers.